Taco Bell teases the potential return of the Beefy Crunch Burrito for $1 with a test of the menu item out in Chattanooga, TN starting April 4, 2018. 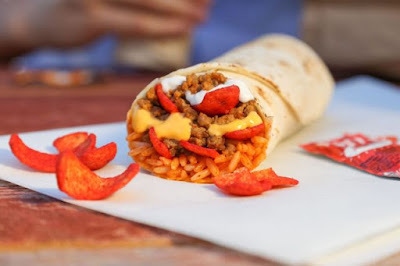 The Beefy Crunch Burrito consists of Flamin' Hot Fritos, seasoned ground beef, seasoned rice, sour cream, and warm nacho cheese sauce wrapped up in a warm flour tortilla. It's been popular enough to garner a Facebook fan page, The Beefy Crunch Movement, with over 68,000 fans (as of this writing). The Beefy Crunch Burrito test will run through mid-July and depending on how the test goes, you might find the Beefy Crunch Burrito back on the national menu in 2019. The Beefy Crunch Burrito test is part of a larger test of a revamp of Taco Bell's $1 Cravings Menu. Other new test items vying for a spot of the $1 value menu include the Crispy Chicken Taco and the Mini Pepsi Freeze. They're also looking into doing a new $5 Cravings Menu that offers several configurations of their long-running $5 Box meals. 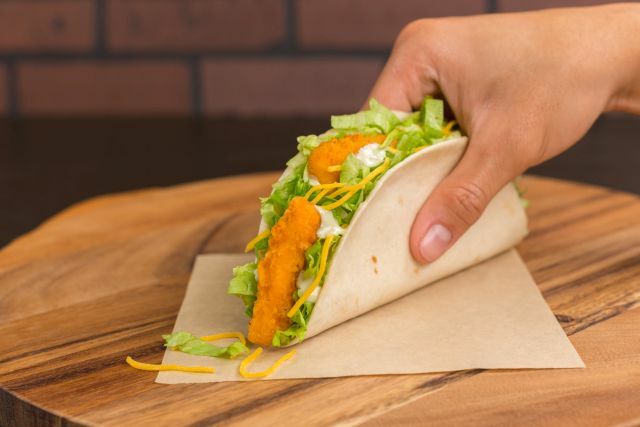 The Crispy Chicken Taco features the Naked Chicken Chips joined by lettuce, and shredded 3-cheese blend, and a choice of either avocado ranch or chipotle sauce (or no sauce) folded in a warm flour tortilla.